Speakers: Graham Davidson and Ian Enters of the Friends of Coleridge, with Kate Innes, poet and novelist and winner of the ‘In Xanadu…’ international poetry competition. This afternoon’s event, arranged by Ian Enters of the Friends and Fiona Checkley of the Unitarian Church, took place exactly 221 years to the day after Coleridge preached the sermon which so impressed the teenaged Hazlitt and which is memorialised so brilliantly in his ‘On My First Acquaintance with Poets’. So, when Graham Davidson climbed the steps of the pulpit set in the centre of the east end wall of this jewel of a chapel, he must have been all too aware of his predecessor’s impact on the congregation. Alas, there were no impressionable teenagers to be seen in the audience. However, the assembled Salopians and others who had travelled to be there heard a rich and deeply thoughtful talk. The talk tackled head-on the question of what exactly Coleridge meant by the word ‘imagination’, linking the celebrated passage in ‘Biographia’ with the ‘Dejection Ode’ and making a fruitful comparison with Wordsworth’s ‘Immortality Ode’. It is far too complex an argument to summarise here, but perhaps the most suggestive point made was that the ‘loss’ to which both poets refer was not, as is often assumed, the loss of their power as poets, but of the sense of ‘Joy’ in life itself, a characteristic, according to Coleridge, of what he called the ‘Primary Imagination’. During the break for coffee, one could examine more closely this beautiful building, where the young Charles Darwin was taken every week by his mother, a Wedgwood, and which contains among other things, a brass plaque commemorating Coleridge’s association with the building. The Church is in excellent condition and exudes a warm, intimate, almost cosy atmosphere, well suited to such meetings. In the second half Ian Enters and Kate Innes were in dialogue, talking about their approach to writing and supplying a contemporary perspective on the imagination as active practitioners. A genuine rapport was conveyed and, unusually for these kind of events, the readings of their own work seemed to arise spontaneously from their conversation rather than being crowbarred in. Ian Enters is a highly effective reader of both his own and others’ verse; he combines the actor’s ability to project to an audience with a writer’s grasp of what is important in a poem. Kate Innes, whose poem ‘The Flock of Words’ was, by miles, the best poem in our 2016 competition, proved a sensitive and illuminating interviewee. Their conversation was always interesting to listen to, and threw a sideways, incidental glance at Coleridge’s own magisterial account of the creative mind, the ‘esemplastic power’. Having only seen the outside of this church before, it was a great privilege to be so warmly welcomed inside. The quality of the speakers’ contributions made for a most memorable afternoon in the company of the resident Unitarians and a faithful few from the Friends. 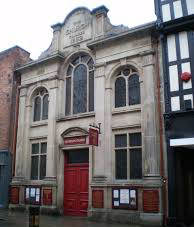 I would like to thank Fiona Checkley and Ian Enters for making it happen, and hope and believe that this will be the start of a mutually fruitful association between The Friends of Coleridge and the Shrewsbury Unitarian Church.